For years, scientists largely ignored the lymphatic system, instead focusing on blood vessels and their growth process, called angiogenesis. Only since the mid-1990s has knowledge started to accumulate about the lymphatic system, the network of thin-walled capillaries that collect and drain used tissue fluids, macromolecules, and cells, sending them to the lymph nodes where they are filtered before returning to circulation. Many have suggested that lymphangiogenesis also may accompany tumor growth and may facilitate tumor metastasis to lymph nodes, but the connection proved elusive. Data derived from the Science Watch/Hot Papers database and the Web of Science (ISI, Philadelphia) show that Hot Papers are cited 50 to 100 times more often than the average paper of the same type and age. 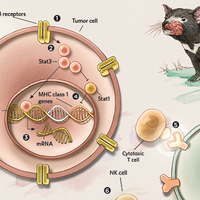 Independently, groups from the Ludwig Institute for Cancer Research in Victoria, Australia, and from the Massachusetts General Hospital introduced tumor cells into immunocompromised mice. By adjusting the levels of two vascular endothelial growth factors, VEGF-C1 and VEGF-D,2 known to be involved in lymphatic and blood vessel growth, each showed that such factors did indeed enhance lymphangiogenesis and metastasis. A third group, including researchers from the University of Geneva Medical Center, crossed mice that overexpress VEGF-C with those that spontaneously produce nonlymphangiogenic tumors similar to human insulin-omas. Their offspring formed tumors with well-developed lymphatics, which resulted in regional lymph node metastases.3 "We were ... able to generate lymphatics at a site where they normally do not occur, namely, around [but not within] islets of Langerhans," says Geneva's Michael Pepper, senior author. Although some still question the connection between lymphangiogenesis and tumor growth, these Hot Papers evoked serious curiosity. "The biggest significance of these papers is that they rejuvenated interest in lymphatics, especially related to cancer," says tumor biologist Rakesh K. Jain of Massachusetts General Hospital, Harvard Medical School. Alitalo, who coauthored two Hot Papers,1,2 published other highly cited work with similar findings.7,8 He says that all five papers "clearly revealed a novel aspect of tumor biology, [namely], the paracrine signals between tumors and lymphatic vessels. They also identified at least some ways to interfere with these signals, and this seemed to inhibit metastasis in the models." In paracrine signaling, the growth factors, cytokines, and chemokines arrive from outside cells to bind with receptors on endothelia, which in turn signal tumor cells. Although experimental models provide evidence of this mechanism, some recent studies have shown no correlation between enhanced expression of lymphangiogenic growth factors in human tumors and metastasis. "The question is still open: if and how much lymphangiogenesis occurs in various human cancers," Alitalo says. In 2002, Harvard's Jain and colleagues found that VEGF-C overexpression in murine tumors enhances lymphangiogenesis at the tumor margins and increases lymph node metastasis, but they discerned no functional lymphatics within the tumors.9 This suggests that intratumoral lymphatics are not necessary for metastasis. Jain says that his own studies of human lung cancer and those of others in head and neck tumors and breast tumors also support the contention that intratumoral lymphatics are not essential for lymph node metastasis. Mihaela Skobe, who has since moved from Mass. General to the Mount Sinai School of Medicine in New York City, explains why she thinks some experiments revealed no signs of lymphangiogenesis within tumors. First, pressure gradients can prevent dyes injected into cancers from entering the tumoral lymphatics. "Fluids and dyes flow according to laws of resistance that are different in tumors compared to normal tissue," she says, Moreover, besides moving fluids, the lymphatic system does the same for cells; these two processes likely involve different mechanisms, she says. Senior author Michael Detmar1 of Mass. General says that the significance of lymph vessels within tumors is debated. But, he says, "It's now widely accepted that the peritumoral lymphatics can be activated by some tumors, and that they play an active role in promoting lymph node metastasis." Detmar and others argue even that lymphatics incapable of fluid transport can serve as conduits of tumor cells, and molecular connections most likely do exist. "We need to understand the cross-talk between lymphatic vessels and tumors," he says. The roles of VEGF-C and VEGF-D also might differ in various cancers, and an "explosion of interest" has correlated these growth factors' expression with metastases in numerous tumor types, Detmar says. For example, both molecules bind to the lymphangiogenesis receptor VEGFR-3 and the main receptor for angiogenesis, VEGFR-2. 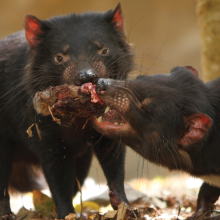 Yet, only VEGF-D induced angiogenesis, according to Stacker and Achen's Australian team, who used a cell line called 293 that produces epithelioid-like tumors in immunodeficient mice. In an E-mail, Stacker and Achen explain that VEGF-D's ability to induce angiogenesis may be due to proteolytic processing of the growth factor in 293 cells. These cells generated a proportion of mature ligand, capable of binding to the angiogenesis receptor, whereas VEGF-C in Detmar's breast cancer model may have been only partially processed, preferentially activating the lymphangiogenesis receptor. Pepper says of his cross-bred transgenic mice, "In our model, we observed a specific lymphangiogenic effect, with no evidence for angiogenesis." 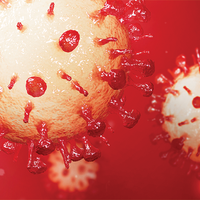 Skobe proposed an alternative mechanism by which VEGF-C and VEGF-D might increase metastasis. 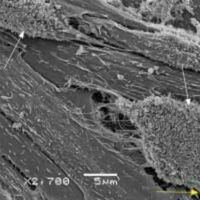 "They may induce lymphatic endothelial cells (LECs) to produce chemokines, which, in turn, may induce the directional migration of tumor cells into preexisting or newly formed lymphatics," says Pepper. Another possibility, he suggests, is that VEGF-C and VEGF-D might alter the adhesive capacity of LECs in a way that permits tumor cells to move into lymphatics. The exciting question is, Jain says, what triggers lymphangiogenesis? "The job of lymphatics is to maintain fluid balance, or pressure balance. If fluid pressure builds up, the lymphatics need to do something to lower it." The implication is that high fluid pressure in tumors enlarges the lymphatics in the margin, and these hyperplastic lymphatic vessels can facilitate metastasis. New cancer treatments could arise from research into lymphangiogenesis, once its mechanisms are better understood; some researchers are trying to inhibit it. Stacker and Achen's group neutralized VEGF-D with a specific monoclonal antibody, and Alitalo's group did likewise with a soluble VEGFR-3 extracellular domain. But, Pepper says he's not certain that this approach will prevent metastasis. "The problem is that most metastases will have occurred by the time the primary tumor is detected." The Scientist staff; Steve Bunk reported this story. 4. A. Kaipainen et al., "Expression of the fms-like tyrosine kinase 4 gene becomes restricted to lymphatic endothelium during development," Proc Natl Acad Sci, 92:3566-70, 1995. 5. V. Joukov et al., "A novel vascular endothelial growth factor, VEGF-C, is a ligand for the Flt4 (VEGFR-3) and DKR (VEGFR-2) receptor tyrosine kinases," EMBO J, 15:290-8,1996. 6. M.G. Achen et al., "Vascular endothelial growth factor D (VEGF-D) is a ligand for the tyrosine kinases VEGF receptor 2 (Flk1) and VEGF receptor 3 (Flt4)," Proc Natl Acad Sci, 95:548-53, 1998. 9. T.P. 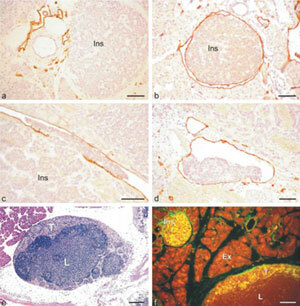 Padera et al., "Lymphatic metastasis in the absence of functional intratumor lymphatics," Science, 296:1883-6, 2002. 10. S.S. Dadras, et al., "Tumor lymphangiogenesis: A novel prognostic indicator for cutaneous melanoma metastasis and survival," Am J Path, 162:1951-60, June 2003.